4 How Do Infrared Heaters Compare to Other Heaters? 6 Do Infrared Heaters Save Money? 7 Is Infrared Heating Safe? An infrared heater is exactly what you need if you’re looking for a safe and efficient heater for your home. Thanks to the way in which they operate, you can be sure of comfortable and safe warmth that heats up your whole body, giving you a far more natural feel to the warmth than any other home heater. If you’re looking for the best infrared heater for your home or work environment, you’re in the right place. These are just a handful of infrared heater reviews that are sure to give you a good idea of which models may be perfect for your home and which models you should stay away from. We’ve also included some important buying information too so that you can learn about how these heaters work. This will help you to compare the best heaters for your needs so that you can find the best one. 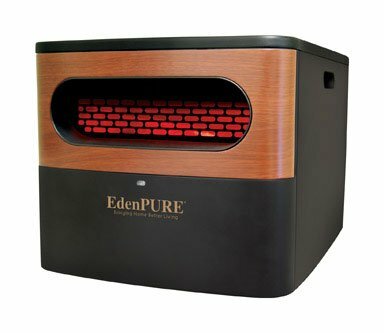 The EdenPURE A5095 infrared heater is one that is the best infrared heater for a smaller room. 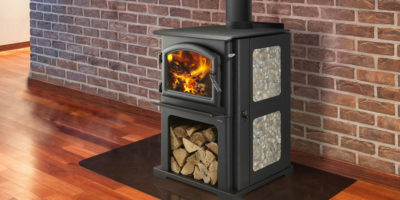 Thanks to its smaller size, this heater is lightweight and easy to transport, so if you have a home that has several small rooms, you would be able to take it from room to room, adding warmth without needing to turn on the whole of the central heating system. 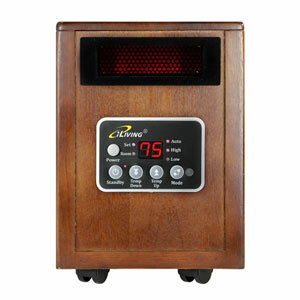 One of the best features of this particular infrared heater is the way in which it heats. Thanks to the safe operating temperature, you can be sure that the temperature of the unit will never get too hot, so you don’t need to worry about this heater becoming so hot that a fire is started in your home. It also emits no CO2 so that’s another concern that you don’t need to consider. On the other hand, it only has a 6-foot long power cable. If you are placing this heater close to an electrical outlet, you’re not likely to have too many issues with this, but you should take care to use the correct kind of extension lead if you want to move the heater out further into the room so that there is no risk of fire. This heater is also not suitable for heating larger areas, or rooms that are particularly cold such as basements. Let’s start with this heater’s dual technology. It works with natural gas and liquid propane. It is very portable because of that its 25.7″ high, 18.46″ width and 9.84″ depth. The first feature we can mention is the thermostat control. Thanks to it the unit switches automatically the burner on and off when a certain temperature is reached. Such a feature gives you a peace of mind and also takes some load off your shoulders to constantly go and check the temperature. Easy, isn’t it? The safety feature is the Oxygen depletion sensor with auto switch off. This one detects the level of the oxygen in the room which is something really important if you are going to heat the place during the night when you and your family sleep. Liquid propane units are banned in some states such as California, so you can’t use it there. 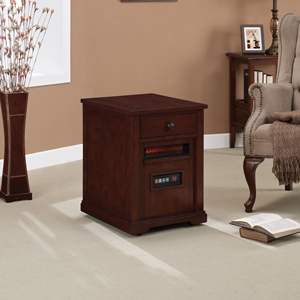 This heater can handle rooms up to 1,000 square feet and warm them during cold reasons. It is a new and modern system that puts out twice the hot air than some other models. The iLIVING heater works really quiet (39 dB) because no one wants strange noises interrupting them while resting after work or during the weekend. There are some safety features that you would like such as the Tip-Over switch off and the Overheat Protection System. These security systems ensure and protect your children and lovely pets. To save you money this unit comes with another feature- the Auto Energy Saving Mode plus el-thermostat. When this mode is on, the heater can heat from 50 to 86 degrees. Other features are the auto shut off timer, high and low flow settings, and the beautiful front panel. 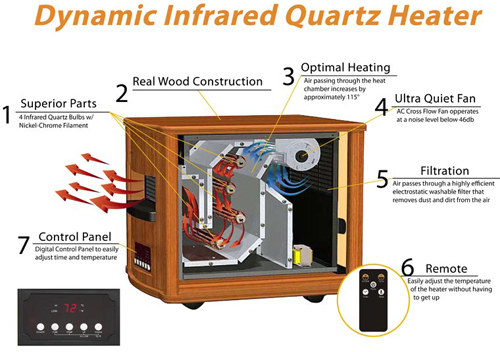 The Dual heating System is again a feature, which combines infrared tube of quartz and PTC technology. 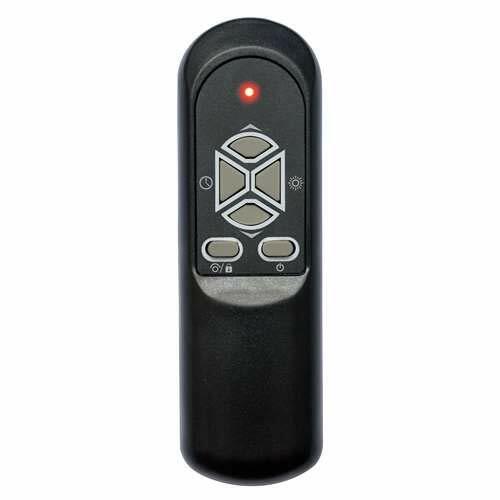 There is also a remote control, to switch the different modes while you are lying on the sofa. The Gadget is very mobile thanks to its 4 caster wheels. This 5,200 BTU infrared heater is great for heating up medium-sized rooms and if you have a room of 1,000 square feet or less to heat, it may be a good option for you. The design of it will complement your existing décor, especially if you have darker wood finishes and as it is tall rather than wide, it will take up less space than other infrared heaters are likely to. To ensure that it is as safe as possible, this heater comes with an automatic shutoff, which kicks in when it hits 80 degrees. This eliminates any concerns about safety whilst you are using it within your home. So that you can carry this heater from room to room, it is lightweight and portable. This allows you to purchase just one heater for your home so that you can heat one room at a time instead of heating your entire home, saving money on energy. Thanks to the infrared heat, you can also enjoy a comforting and effective warming effect. One of the only setbacks that you may find with this heater is that it has an integrated fan to aid the circulation of the warmth, and this does produce a low level of noise. During the day, you probably won’t have many problems with this, but if you are a light sleeper, you may find that it becomes an annoyance if you have the heater in your bedroom whilst you try to sleep. The Dr. Infrared Heater is just what you need if you’re looking for an infrared heater that is capable of heating a larger room. With both high and low settings, this infrared heater gives you the ability to turn up the heat when you need to and turn the heat back down again so that you can save energy. One of the best features about this heater is that it comes with an inbuilt humidifier. When you have the heating on in your home, especially over the winter months, you can find that the air becomes dry and uncomfortable. The humidifier creates a gentle mist to ensure that there is still moisture in the air. Many users like the overheat protection that is built into this heater, but as it is on wheels, it can be a little easier to knock over. You can take the wheels off if you wish, and this will help to stabilize the unit so that it is less prone to being tipped over. The Duraflame PHM8101-O142 is a high-quality infrared heater that is designed for supplemental zone heating around the home. 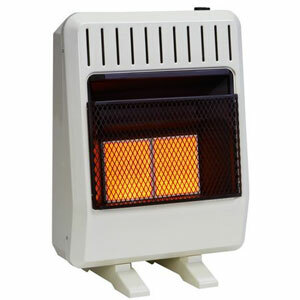 If you want to heat a room of up to 1000sq feet, then this heater will be sufficient for you to do so. 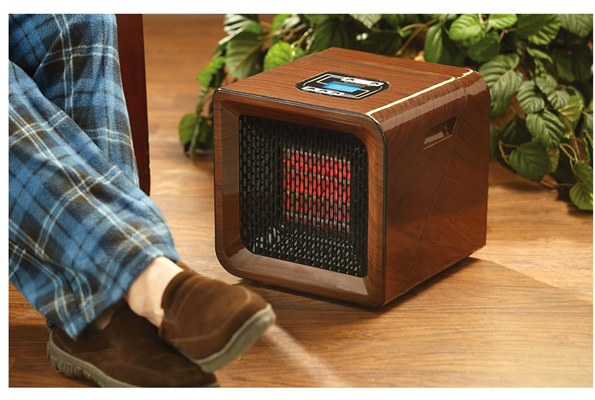 The wooden casing looks great and ensures that this heater will fit in well with your home’s existing décor. As well as being aesthetically pleasing, the wooden enclosure allows the heater to remain cool to the touch to provide ultimate safety for the whole family. For fast and immediate heating, this heater is a great choice, but it may not be the best solution for long-term supplemental heating. It runs using 1500watts of electricity and this can be uneconomical in the long term. In addition, there is no other setting other than “on” for this heater, so there is no way to increase or reduce the temperature and power output as required, making it a little more wasteful when it comes to electricity use. The positive thing about this heater, however, is that within just 10 minutes, your room will be lovely and warm, and you will be able to enjoy more comfortable and humid air than if you were to use an alternative heater. It is also extremely quiet whilst it is on so if you want to use this heater whilst you sleep, you’ll be able to do that without being kept awake. With 3 heat settings, which include an energy-saving eco mode, it’s not surprising that this infrared heater from Homegear is such a great choice amongst users. Operating between 1.5KW and 750W, this heater can provide plenty of power when you need it and can save money when you only want to add a little supplemental heat to your room. Plastic housing ensures that it does not become hot to the touch so that it is completely safe to use in your home. The LED panel on the front is a nice touch as you can monitor the unit with ease, and a remote control even allows you to control the heater without needing to get up from your comfortable position. Although this is a versatile and powerful heater for heating a medium sized room in your home, you should be aware that 1.5kw is only suitable for warming a room of up to around 1,000sq feet. As long as it is used for a purpose, this heater is not likely to disappoint. You’ll be able to use this heater in your home without worrying about any annoying fans or noises, as it is almost silent in its operation. You can enjoy reading, watching TV or sleeping without any background noise whilst this heater is on. 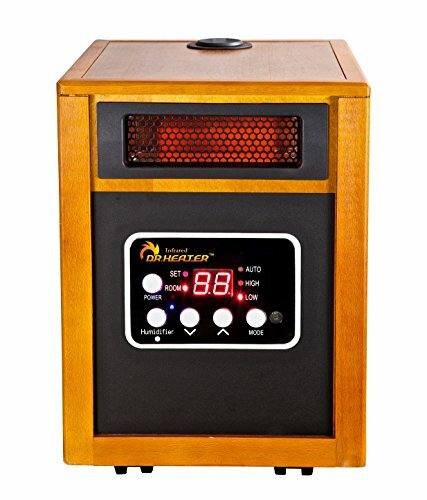 The traditional style of this infrared heater will certainly fit into many homes’ existing décor, and if it’s convenience and effective operation that you’re looking for, then you can rely on this heater. Many users choose this model as it provides comfortable and reliable warmth for your room whilst bringing you the various benefits that infrared heating has to offer. If you do not want to run your central heating throughout your home, or if you have air conditioning on in some rooms but need to keep others warmer, then this heater may be just the solution. The capacity of the heater is as such that it is suitable for medium to larger rooms in the home and you can set a timer if you wish. The timer can be set for up to 12 hours, offering you a customizable experience. In addition, this heater allows you to choose from high, medium and economy heat modes so that you don’t need to use just one heat setting at all times. 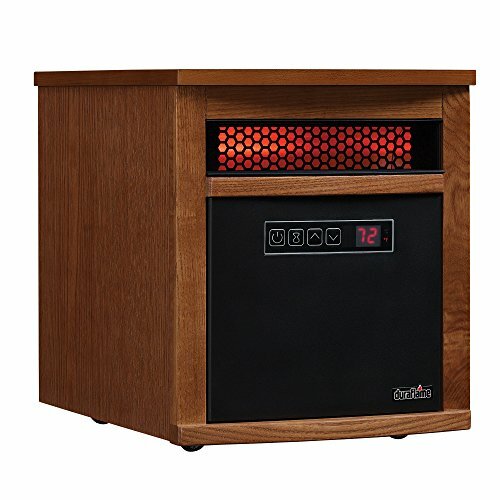 The safety features that come with this infrared heater are designed to give you complete peace of mind. It comes with anti-tip-over shutoff, over heat protection, an exterior case that is cool to the touch and even a child lock. An infrared heater works by using infrared rays, much like the sun emits to heat our planet. These rays are at a frequency of between 9 and 14-micron meters and they enable space to be heated evenly and safely. 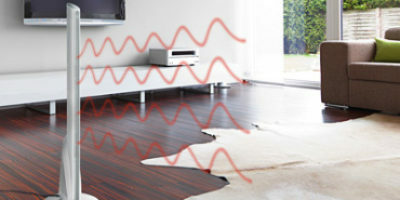 The infrared waves heat up particles in the atmosphere, causing them to circulate and this results in the room feeling warmer and the person or people in the room with the heater, feeling as though they are being warmed. Unlike most of the other heating systems that are available on the market, infrared heaters are surprisingly cheap to run. This is because other heaters require larger amounts of energy to create a lot of heat. Other heaters rely on convection currents, involving heating the air so that it rises, and providing a constant supply of heated air for continuing this process. Because of the wasteful way in which other heating types use energy, you will find that as a comparison, you can save around 50% of energy with the use of an infrared heater. Another great way that infrared cuts down on your energy bills is that the heat cannot escape through ventilation ducts or open doors. 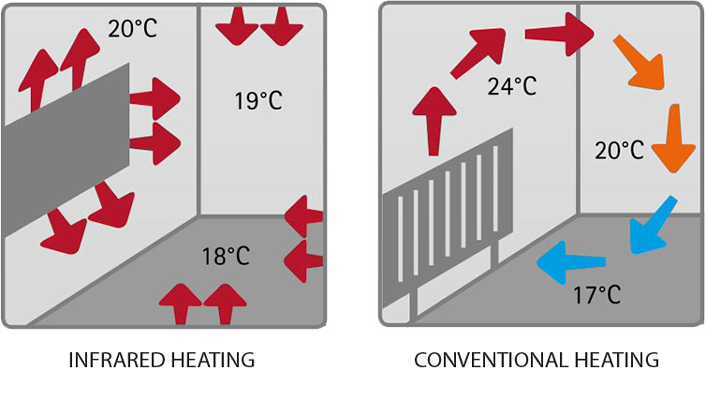 Because the heating method doesn’t rely on circulating warm air, there is no warm air that can escape from the room so this provides economic benefits to the user. Not only is infrared heat less expensive than other forms of the heating system, but you will also be able to benefit from a more comfortable heat. Instead of making the air seem dry and stuffy, infrared heaters release warmth into the air using infrared rays, which gently heats and locks in the warmth. An infrared heater works very similarly to the sun and so you will feel warm but not uncomfortable like you would feel on a summer’s day. Heating a single room at a time will be more economical than heating your whole home. If you are only going to heat one room without moving the heater around your home, then just take the measurements of that room. Otherwise, you should take the measurements of the room that is the largest in your home. If you have one or more particularly small rooms, and then one or more large room in your home, you should consider purchasing a dual mode heater. These infrared heaters allow you to choose a higher setting for larger rooms and the lower setting for smaller rooms. You should ensure that you purchase an infrared heater that is designed to heat the area of your room. If you buy a heater that is too powerful, you will end up wasting energy whereas if your heater is not sufficient to heat the space that you have, you may end up with a heater that does not make much of a difference to the temperature of the room. You could heat a room for as long as you wish with an insufficient heater and the room will never become warm enough, which is a major false economy. Maximum portability – If you want a heater that you will be able to take from room to room with ease, you should look out for ones that have carry handles and wheels. These units can be conveniently and easily moved around your home and are usually designed to be lightweight. You should be careful however if the unit has castor wheels, as these heaters could be a little easier to tip over than stationary units. Limited portability – If you would simply like to move the heater around the room, or just have a heater that will be able to stand in the middle of the room whilst you are using it, then you could purchase a larger unit. These are better if you need to heat a particularly large space and they are usually difficult to tip over. Fixed units – if you need to install a heater in your home, garage or business and you want to ensure that it is completely safe and permanent, you can purchase fixed infrared heaters. These may be attached to the wall so that they can remain in the same position. The fixed infrared heater is the sensible choice if you want a heater that cannot be tipped over and a solution that can be safely mounted out of reach. When you are looking for an infrared heater, something that may be relatively important to you is the way that it looks in your home. If you like to ensure that all of your furniture and appliances match each other, you should make sure that you’re buying an infrared heater that will tie in with your existing decor. 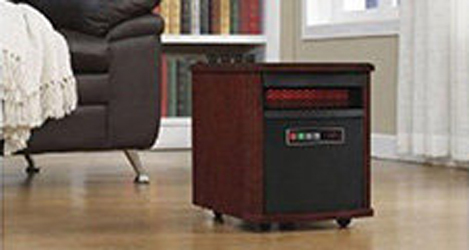 As infrared heaters don’t get warm to the touch, many of them are made with wood casings. This traditional material is likely to fit well into many homes and you can usually choose from different colors of wood casing. If the wood is not something that you already have as part of your home’s décor, you can find others that are made of aluminum and are finished in a variety of colors. For rooms that are a little cozy, look out for designs of infrared heater that are taller. These will take up less floor space, using up less of the room. Of course, these are going to be easier to tip over than shorter and wider units, so this is another thing that you will need to bear in mind. If you want to be able to see at a glance what setting the heater is on, you will be able to get an infrared heater that comes with a digital display. You will be able to see what temperature it is set to as well as any remaining time if the heater has an inbuilt timer. Anti-tip shutoff – If the heater gets knocked over and it has an anti-trip shutoff built in, then it will turn itself off. This ensures that the heater does not pose any threat from fires if it is accidentally knocked over. This is most useful in homes where the residents are elderly, or for families with children or pets. Timers – Some infrared heaters come with a timer function. Not only can this save you money by not being left on accidentally, but a cutoff timer can also ensure that the heater does not have a chance to overheat and start a fire. Purchasing an infrared heater, or indeed any electrical appliance comes with various risks; such as faults in the manufacturing process or electrical faults that can occur in the months after you purchase the item. To protect your purchase, you should look out for the manufacturers or resellers who offer you a warranty. The longer the warranty, the longer you can enjoy complete peace of mind for. You should make sure that you check the terms of the warranty before you make your purchase so that you know what is covered. When you are looking for an infrared heater, you’ll notice that there are many different places where you can purchase a heater. If you want to get a heater quickly, then your best option may be to simply go out and buy one from a local electrical store, but there are plenty of other places to buy them. On the high street – These heaters will be convenient for you to buy if you simply can’t wait to get hold of your heater, but it will cost more than if you were to buy a similar model online. You will also have fewer options to choose from. Online manufacturer – You can purchase most infrared heaters directly via the manufacturer’s websites. You can sometimes get some good deals online and you may find that the prices are cheaper if you go directly to a manufacturer. You will have more choice than a high street store. Online market sites – There are plenty of other sites such as Amazon or eBay where you can purchase infrared heaters. You should be careful that you are purchasing a brand new item on these sites, as there are often items for sale that are refurbished or used. A good tip is to look out for the sellers that offer some kind of warranty, as this will give you peace of mind with your purchase. There are many differences between infrared heaters and the alternative space heaters that you can buy today. Whilst they all have their own pros and cons when compared to each individual’s needs, these are some of the main comparisons that can be made between infrared heaters and other kinds of heaters. 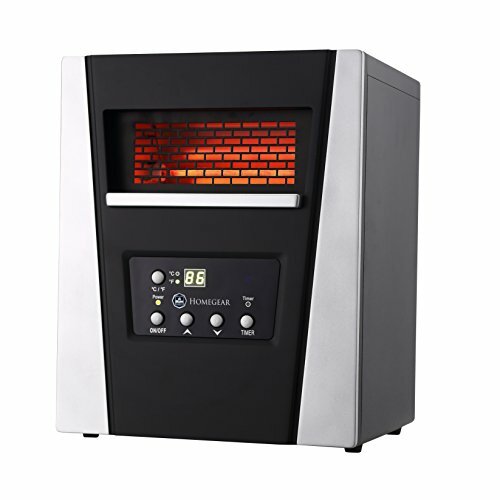 When you use an infrared heater, you can enjoy the immediate heat, unlike with a standard convection heater. Convection heaters need to heat the air and then rely on the warm air rising to create a flow of warm air around the room. This process usually takes quite a while before you start to feel the benefits. On the other hand, infrared heaters use infrared rays to send heat around the room and instead of heating up the air, the rays heat up objects, keeping you warmer and making you feel warmer more quickly. If you’re sitting in one place in the room, you should point the infrared heater towards you so that it will heat you up directly and not the whole room. Infrared heaters don’t require a fan to distribute the heat around the room. Unlike other heaters that can be very noisy when they are running, infrared heaters are usually very quiet when they are on. If you want to add more heat to somewhere that requires minimal noise, for example, your bedroom, you can use an infrared heater, as it will be so quiet in its operation. When an infrared heater warms up, hot coils evenly disperse the heat over the source of the infrared beams. The infrared waves are reflected out into the room by reflective metal plates and this allows the warmth to be spread over a distance, resulting in comforting and gentle warmth. In addition, infrared heaters don’t reduce the amount of moisture in the atmosphere, so the air does not try out. Other heaters are known to leave your skin and even your sinuses feeling dry and irritated as you will end up breathing in the stuffy and dry air. Infrared has even been known to improve blood circulation. Because infrared heaters work by heating the objects around them, they don’t waste energy by warming up the unused space. Infrared heaters also provide instant heat instead of needing to wait for a conventional heater that takes a long time to heat the air enough for it to begin to circulate around the room. You will end up with lower heating bills as a result of this. Some heating methods rely on burning fuels and this can produce harmful gasses in the atmosphere. You will be able to enjoy safe and clean air when you use an infrared heater, as they do not produce any harmful gasses. In addition, they use less energy than alternative electric heaters because they provide instant heat. Less energy means that an infrared heater has a lower carbon footprint than most other heaters. It also uses electricity, which is a renewable energy source, so again, this is good for the environment. First of all, you will need to ensure that you purchase a heater that is large enough to heat the largest room that you will require it for. You should also ensure that it would not be excessively large for the smallest room that you’ll need it for. Having a heater that is insufficient will mean that you may never feel the complete benefit of having the heater on, which could be a waste of energy. A heater that is too large for the room, on the other hand, may use an excessive amount of energy that is not actually needed, resulting in the room becoming too hot too quickly. Having an infrared heater is great for saving energy, as the infrared waves that are used to warm the atmosphere do not rely on convection currents as other heaters do. When other heaters warm large quantities of air, the warm air then rises and circulates around the room, potentially escaping through air ventilation and open doors and windows. Infrared warms up objects and people rather than the air, meaning that the warmth can’t simply escape out of the window. This can save you up to 50% on energy bills. You must remember that an infrared heater is intended to be used on its own so that you don’t have to turn on your home’s central heating system. If you use the infrared heater along with your central heating system, you may not notice much of a difference in your energy bills. What most people want to know is whether or not infrared heating is actually safe to use in their homes. 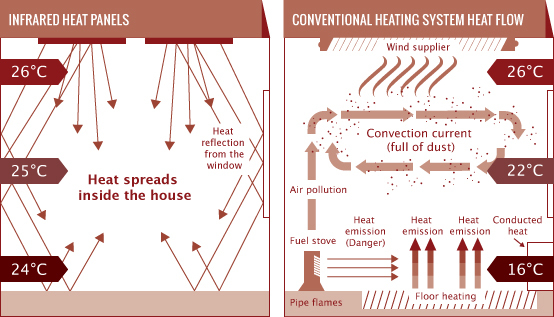 If you compare it to other methods of heating the home, it certainly is. With a coal, gas or fuel heater, you will need to have a flame. This is also true for pellet stoves. Although some people like these kinds of heaters as they provide a more traditional heating method and maybe a little cheaper, toxic gasses are produced. When using these heaters indoors, it is important to have sufficient ventilation installed so that the gasses can be properly ventilated. You will also need to make sure that any fuel is stored safely as it can be flammable. In comparison to electric heaters, infrared heaters can also be far safer. Infrared heaters don’t get as hot as some electric heaters when they are in operation. You should still follow proper safety precautions with your infrared heater, but usually, you will be able to enjoy a perfectly safe. As these heaters use infrared rays like the sun to warm up your room, you can be sure that you won’t experience dry air or a stuffy atmosphere, which can exacerbate winter illnesses and other conditions such as asthma. Fire is, of course, the main concern with infrared heaters. Although these are safe heaters, you should still ensure that other objects do not obstruct the heater. Make sure that you don’t use the heater as a table, and keep any objects such as documents or cloth materials off it. This will prevent items that are too close to the heater becoming hot and catching fire. Always purchase an infrared heater from a manufacturer that you can trust, and make sure that the heater is certified for safety. Most appliances are designed to follow the strict guidelines that are in place for safety, but you should always check any labels before you turn on the heater. Infrared heating will not dry out the air. Dry air can be hazardous to health as it exacerbates existing conditions and can also cause health problems. Dry air can cause or worsen the effects of asthma, bronchitis, and sinusitis. It can also cause you to lose water from your body during respiration, which is not then breathed back in, causing dehydration. Thanks to infrared heat, you’ll not experience these problems. There are even some infrared heaters that come with an inbuilt humidifier to make the air a little more humid for added comfort. Infrared heat has also been known to help aid blood circulation. During the colder winter months, its very likely that you’ll be resting more than usual, and this can lead to decreased blood flow. Infrared heat gently warms your body using infrared light frequencies and this can actually help your blood to circulate better. When you use an infrared heater, you’ll find that it is very quiet in its operation. Although at first, this may not seem like a health benefit, it contributes to quite a significant one. If you wish to leave the heater on overnight to keep you warm whilst you sleep, you will be able to do so without worrying about it keeping you awake at night. Sleep is very important for our health, so ensuring that you have a good night’s sleep whilst still staying warm is a huge health benefit offered by infrared heaters. You may also be interested in Radiant Floor Heaters! Infrared heaters are a great way of adding warmth to any room in your home. As long as you choose the right infrared heater for your needs, you are bound to save plenty of money on your heating bills as you won’t need your entire central heating system to be on and you can also make significant savings in comparison to alternative home heating methods. Not only can you enjoy monetary savings when you choose an infrared heater, but you will also be able to benefit from plenty of other benefits, including safe and healthy operation. These infrared heater reviews are a great place to start when you are looking for a great heater for your home, but there are many other models for you to choose from so that you can find the best infrared heater for your needs. Remember to keep in mind our buying guide when you are making your decision so that you can consider all the requirements that you may have. I’ve had an Edenpure Gen4 for at least 10 years and have been using it a lot . It does have a fan which is very quiet . Over 10 years, I only had to change a hear senser which was not at all expensive. Unfortunately , There are no service depots within Canada. Nevertheless, k can pic haste parts if. Ended on Line.